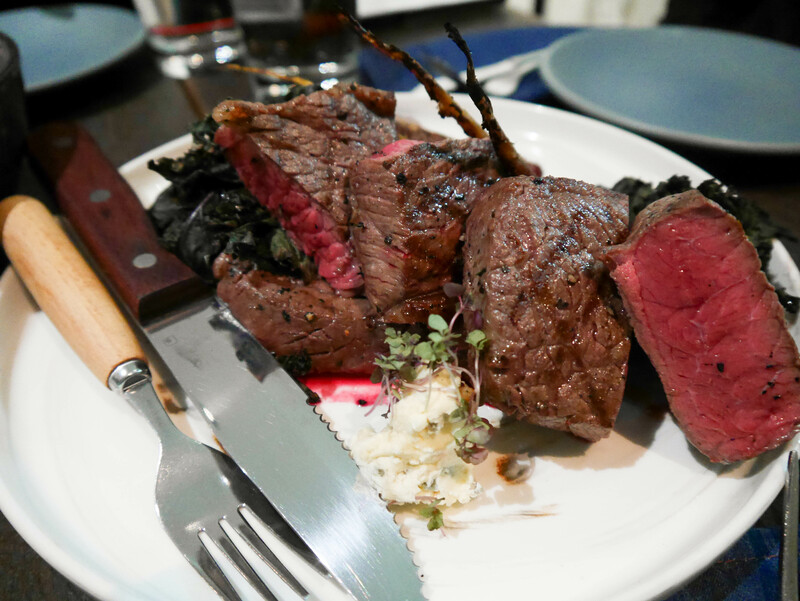 The folks at Oratnek have invited my friend Erina to check out Overtime at Oratnek, their latest foray into dining after dark. Myself, Jeff and James do what we do best and ride on the coattails of Erina’s instafame and join as her +3s. Oratnek is apparently coming up to their one year anniversary of being open at their quaint little home in Redfern, a true testament to their ability to continuously accommodate the colicky nature of Sydneysider’s eating habits and also Jesus, how time has flown since my last two visits to Cafe Oratnek. I’m sure the cat’s out of the bag now but if you’ve yet to realise, prepare to have your mind blown by the fact that Oratnek is actually chef Kentaro “Kenny” Takayama’s first name spelt backwards. His roots are old school brunch spot Bill’s so you know that you can trust him with your first meal of the day. Overtime at Oratnek is currently a seven-course set menu that goes for $55 per person with an added BYO option at $4 per bottle. We’re here tonight with other food bloggers and influencers in tow as guests of the restaurant, to try the menu and to critique it before it’s open to the public. I’m placing a relatively large emphasis on this point as the menu stands to dramatically change as this is just a preview and they’ve also made it clear that they will definitely be taking on our feedback. First up to bat is the the mini soft shell crab burger (pictured above). It’s served up on a platter which gives you a one each option and they’re quite dainty. 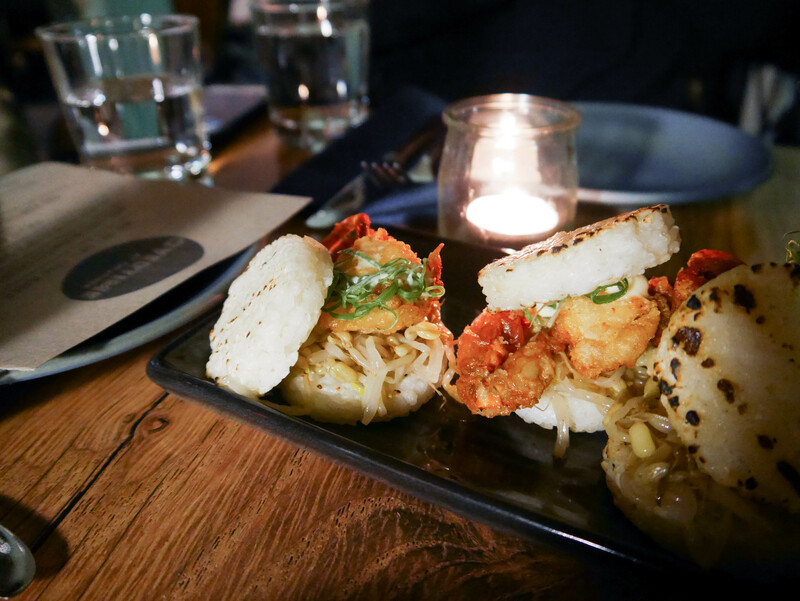 Each individual slider comes with a hunk of soft shell crab, bean sprouts, shallots and a smearing of lime mayo with cajun spice. As far as portions go I was very happy with the amount of seafood meat that was portioned out. I was also pleasantly surprised that it went well with the bean sprouts, not something that I usually have with soft shell crab. The mayo acted as some decent lubricant to break up the crunch although I can’t really recall much of a spice kick to it. Where the burger fell a bit flat was in the rice bun itself which we found a little too starchy and kind of gluggy towards the middle. There is definitely a significant blame on our part though as Jeff and I didn’t want to start until Erina and James arrived. Add that to the cold wind in the outdoor seating area yesterday and whatever warmth the burgers had were promptly extinguished by us waiting for too long. Next in line is the miso, fruit and marinated chicken thighs. I know that the banana and chicken combination is a real thing but seeing the word ‘strawberries’ on the menu really intrigued us. When it arrived at our table there were no fruit in sight, with the closest thing resembling any being the pickled cucumber and daikon. 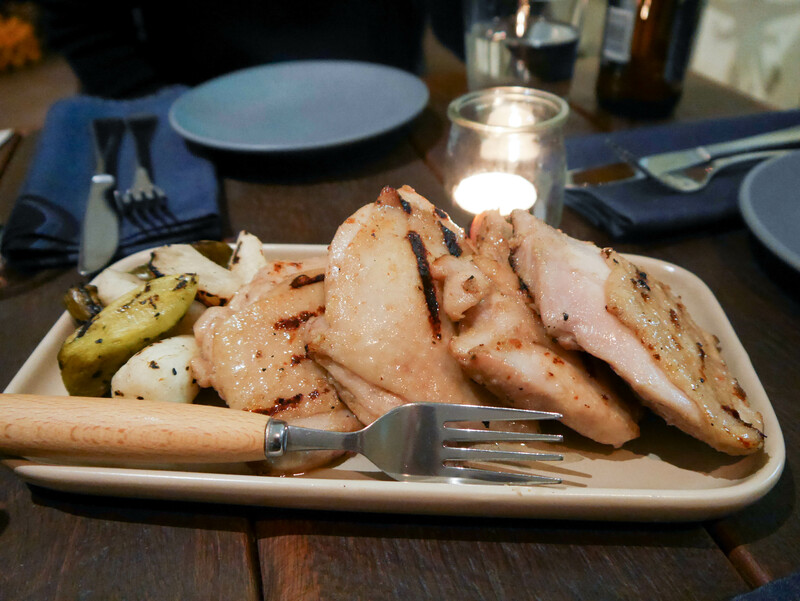 We realised upon cutting into the thighs that the fruits had probably been used in the tenderising process as the meat was so incredibly succulent. It was an excellent piece of chicken in terms of texture. Taste-wise, it wasn’t bland but it didn’t seem to have any kind of discernible flavour bar a slight tinge of sweetness. We couldn’t detect very much miso. I loved the crunchy daikon and I’m not sure what Kentaro-san did to the cucumber but I usually have a huge aversion to all things gherkin and pickles BUT his was awesome and oddly, quite savoury without any of that minty fresh water taste that I dislike in them. Number three to the table is the chargrilled scallops with spring pea salad. 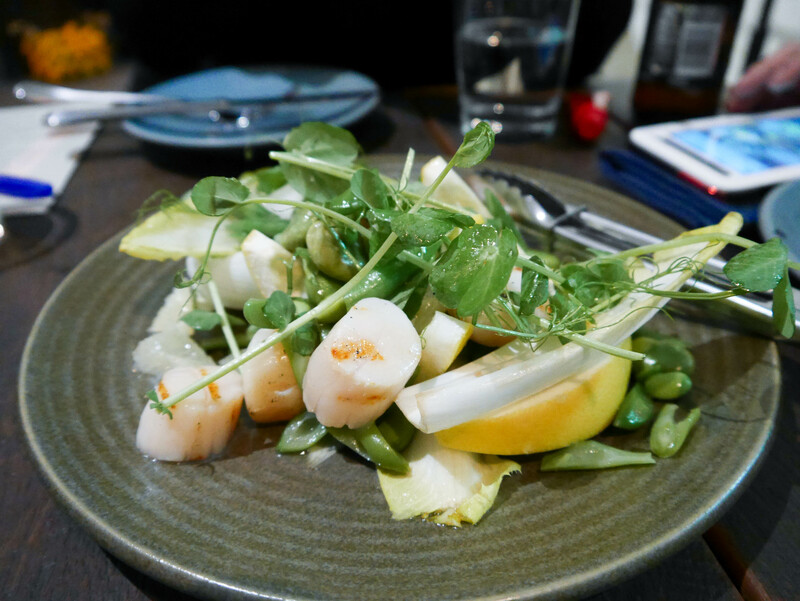 In addition to the scallops, the salad is tossed with white grapefruit pieces, snow pea shoots, witlof and different types of peas including edamame and some broad beans. Pulling it all together is meant to be the wasabi dressing. While the scallops are a little on the small side, they taste fresh and are very plump, with a good amount of char on both sides. There are enough scallops that each person would get two. I like the bite there is to the edamame and surprising myself I attack the witlof as it’s crunchy without any bitterness to it at all. However there are some elements to the salad that I don’t really get. The broad beans taste a little too raw, but again I’m used to them being heavily salted and deep fried as a beer snack so this could just be how broad beans are meant to be. I don’t mind the grapefruit but some members of the table have issues with the presentation that included large pieces of grapefruit peel. I’m not a fan of salads that are drenched in dressing but I feel like Oratnek could have used a heavier hand with the wasabi dressing this time as it was again hard to detect what the menu says should have been there. Above all though, the salad is cold. Very cold. Despite being moved into the inside dining area (props to the waitstaff for accommodating us! ), the salad does nothing to dissipate the winter chill that sits in our bellies making us wonder if this is more of a summer salad than an autumn/winter one. With a quick palate cleanse of Japanese sake (hey Oratnek, what sake was that? I loved how mild it was), we’ve moved into main course territory. A plate of some very formidable rump steak is brought out. On it are baby purple carrot, baby eggplant, purple kale and shiso. To bring the elements together, there’s a copious amount of beetroot sauce and a chunk of blue cheese. Served alongside the beef is the shimeji mushroom rice that’s topped with carrot, burdock, shallots and seasoned with sake, soy sauce and mirin. While the steak is cooked to my favourite level of doneness (blood doesn’t scare me), it somehow manages to retain quite a toughness to it that’s not very pleasant to eat. We look at each other taking big swallows to get it down. I enjoy the beetroot sauce and use it to slather the purple carrot and the kale of which the latter is a little on the burnt side. My favourite part of this dish is hands down the baby eggplant that’s well-seasoned and oh so tender that it surrenders completely to my fork. I’m not really sure what the blue cheese adds to the dish but being a fan of the cheese, I eat it anyway. It already feels like there’s so much going on with the plate of beef and to imply that the rice is an accompaniment is a little overwhelming. Of the two though, I enjoy the rice much, much more. It’s been awhile since I’ve had mushroom rice and I love the delicate aroma and the not-too-salty-but-still-umami taste there is to it. 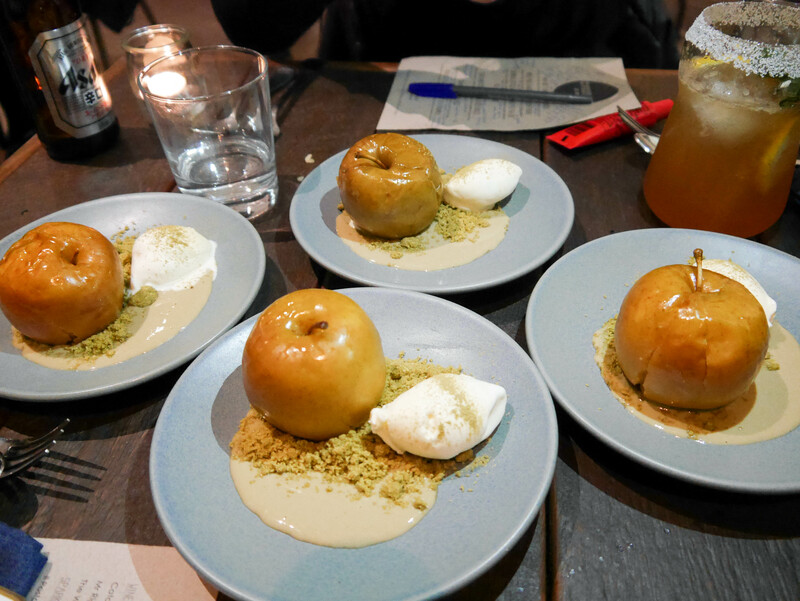 Last and best to come is the roasted fuji apple with green tea crumble, burnt tea anglaise and vanilla ice cream. This is a dessert I would come back solely for and is probably the best dessert I’ve had in the last few months. The fuji apple is firm but several jabs of a fork and knife caves the flesh within. It’s sweet but not overwhelming thanks to the tartness. As a real surprise, there’s actually some cream cheese down through the core of the apple. It sounds odd but it works so well, the cheese is warm and lovely. Pair it with the crumble (intense matcha game going on here) and some cold ice cream and you have a beautifully deconstructed apple crumble. It’s the little things that matter here too, the anglaise also adds a depth to the flavour. Chatting with the other diners after the dinner reveals that the decision is unanimous, Oratnek’s dessert is kickass and the best course of the night. 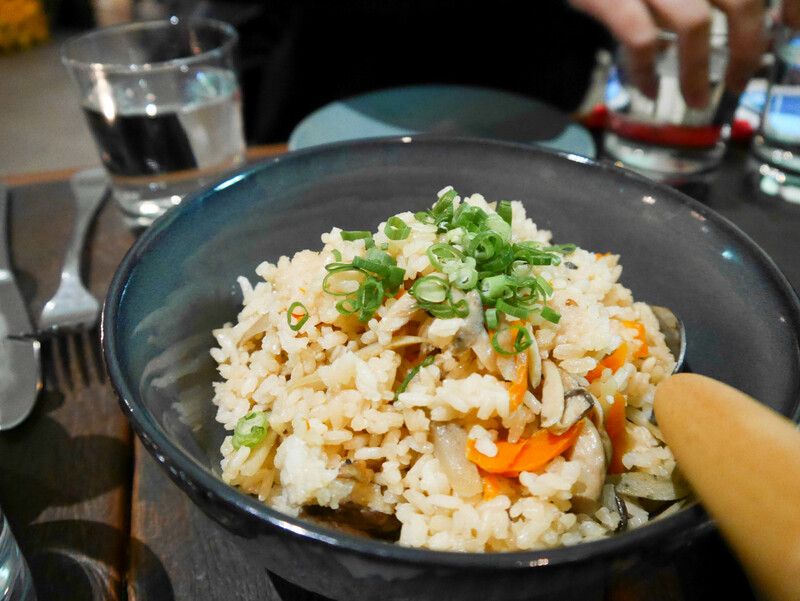 Putting the apple aside, I’d have to say the shimeji mushroom rice was my favourite course. It’s a little bittersweet though as it leaves me with a longing in my heart and wondering what could have been if Oratnek did something that stuck a little more true to their Japanese heritage. I have no problems with fusion food and living in Australia, I rather embrace the mish-mash cuisines we have. But while every course had it’s strong points, it’s biggest failing is probably from trying to do just a little too much with every dish. At $55 per person, you are getting quite a deal if you appreciate the course-by-course style of the menu and the stellar waitstaff service. Sure they were exceptional to us but I’m confident that they’ll be that switched on every night for all their dining patrons. It’s great to see that Oratnek has managed to retain the homely feel of its cafe all the way into the nighttime. More than once we comment it doesn’t feel like we’re dining at a restaurant but in the warmth of someone’s home. That for me is probably the key ingredient for any restaurant’s success this winter.